Jasmine and Cady have some of the best laughs ever. During their engagement session they both had each other laughing the entire time. 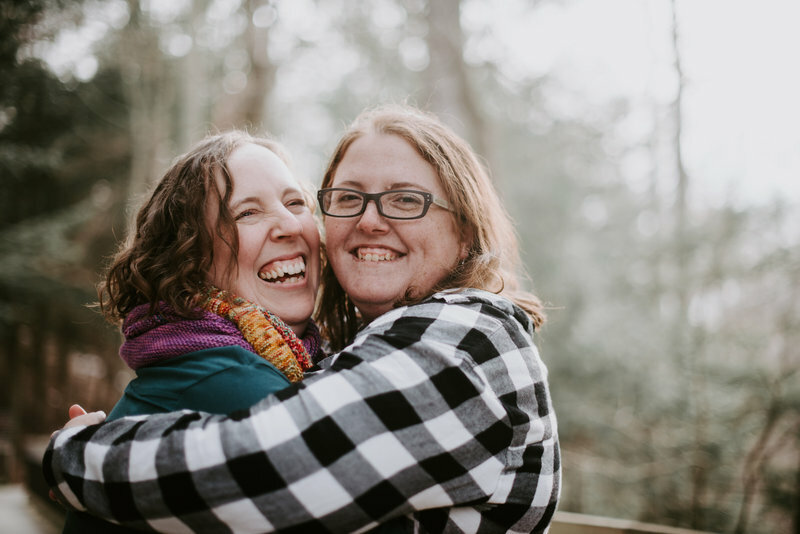 They had reached out looking for LGBT engagement photography as well as someone to capture their wedding! I was so happy that they found me, we mesh really well and they value those candid moments that I try and focus on. We headed to a new location for me, Bysterveld Park in Dorr, Michigan and had a great time exploring. These two are planning a gorgeous day for summer of 2019 at Apple Blossom Chapel and Gardens in Fennville, Michigan. I’ve photographed there a few times and it promises to be a stunning day. I always love doing engagement sessions with my couples and LGBT engagement photography has a special place in my heart. Some of my absolute favorite photos have come from these sessions. As you will see in the photos Jasmine and Cady are a perfect match and I seriously cannot wait to see them get married! 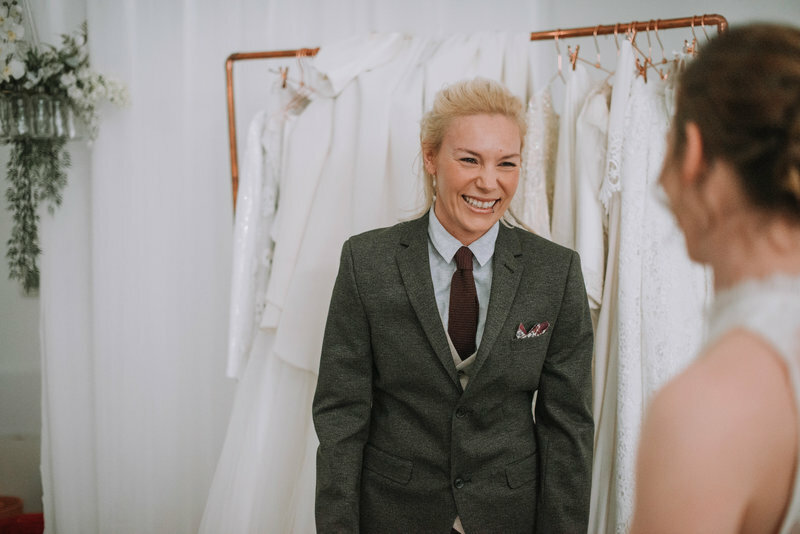 For more info and to hire Liv Lyszyk Photography for LGBT engagement photography head to the website! Click the links below to see more! Day reached out to me a while back needing a kickass wedding photographer for their July nuptials. It became clear after our first phone call that we were officially new BFF’s and I was the one for them! Signed, sealed, and delivered, Day reached out and needed a last minute engagement session too! Their plans fell through and they needed a save the date photo so I became not only their wedding photographer but their Grand Rapids engagement photographer as well! We wiggled our schedules around and they were so gracious and willing to come to Grand Rapids all the way from Detroit on a chilly Sunday morning. They picked two amazing locations, a more floral and organic mural and then the parking structure. I loved the diversity of the lines we got to capture, and their outfits? NAILED IT! Needless to say I’m so pumped for July, hopefully it’ll be a little bit warmer than it was during the session and I’m sure the photos will be even more incredible! 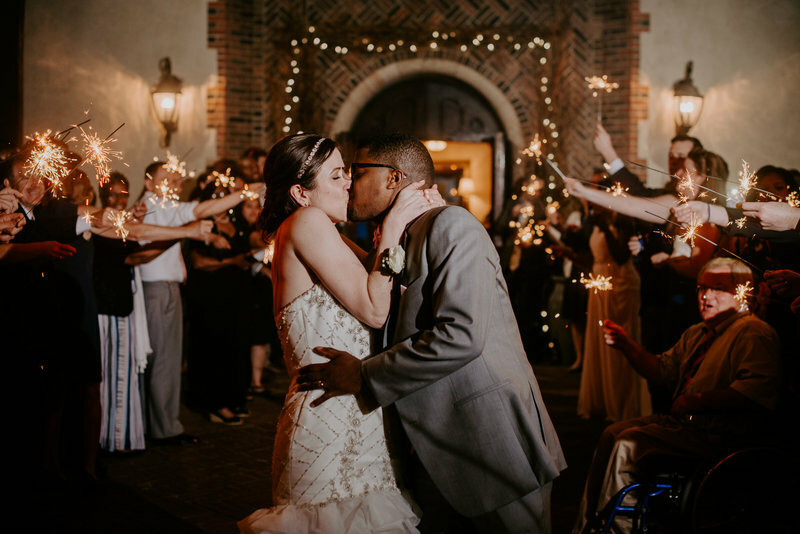 To find out more information or to hire Liv as you Grand Rapids engagement photographer check out the website or links below! Zoey, Jake, and Harrison are three of my favorite people. I’ve been photographing Harrison since he was about the size of a strawberry when Zoey was pregnant. I might be a little biased but I love being their Grand Rapids portrait photographer. In fact I photographed them on a Sunday, so that just shows you how much I love them. Anyway, we headed to Huff Park on the Northeast side of Grand Rapids. It’s a hidden gem with some great walking trails, a brand new playground, some bridges, baseball fields etc. It’s one of my favorite little spots. Luckily Harrison (and Whistler) were super cheery and alert, which made for the CUTEST photos! Don’t worry, we snapped some of just Zoey and Jake too because, let’s be honest, after you have a kid you rarely get photos of just the two of you. Needless to say we had a blast and I’m super happy with the photos! To hire Liv as your own Grand Rapids portrait photographer check out the website or the blog posts below! Kim and Guy are my people. I’m so thankful that their google search for “West Michigan engagement photographer” pointed them to me, the stars aligned, and here we are! They had reached out to me early this year and life happened and we lost touch. Kim emailed me a few weeks back hoping I was still available, which thankfully I was, and booked on the spot! I was so excited to see the spot they picked for the photos. A family member was selling the house, read lakeside mansion, and knew it needed to happen soon. Luckily we picked a day and when I arrived I was blown away. Not just by the house, but by both Kim and Guy (and their pup Lulu). Instantly we bonded over our love of The Office and it was such a breeze from there. Kim is a hairstylist and does AMAZING work in Illinois. She also does tons of weddings too so swapping stories was a blast. I found out that this was the place where Guy asked Kim to marry him and it made the day that much more special. They were a little nervous at first but after cracking some “that’s what she said” jokes they were modeling like pros! The beach we were on was nice and private, also helped that it was a Monday morning too! Being a West Michigan engagement photographer I get to go to the beach fairly often for sessions and this one might be my favorite! These two are such a joy to be around and I absolutely cannot wait until they tie the knot next October! There are plans for a Date Mike cardboard cutout and if you know me at all you’ll understand how freaking excited that makes me! But for now enjoy these adorable photos with their sweet little Lulu! 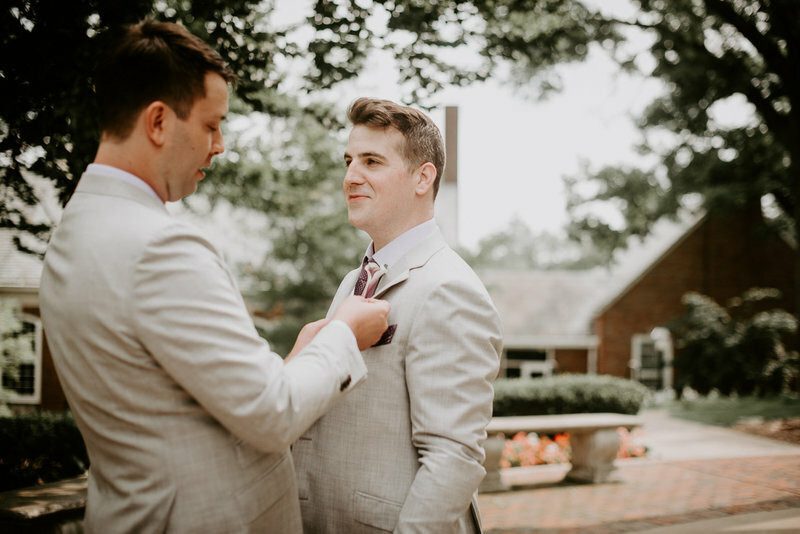 To learn more or to hire Liv Lyszyk Photography as your West Michigan Engagement Photographer check out the website, or click below to read more! Ashley has been doing sessions with me throughout the year and it was so fun to be her Grand Rapids family photographer as well! We’ve gotten to know each other pretty well over the last few months! Ashley runs a disney blog and instagram so our photo sessions are so fun and whimsical. This time she wanted to include her beloved pups and husband! I arrived at their house which has a perfect little dead end next to it. This allowed us to be in the street and photograph! Ashley brought out some super cute elements to be included and of course the pups loved every minute! As a Grand Rapids family photographer who’s worked with pups before I knew that having treats in my hand as I snapped away would help everyone. It worked perfectly and everyone sat so perfectly the whole time. Admittedly it was a quick session including the dogs before they got put back inside, but nevertheless it went super well! Ashley and Dan hadn’t really gotten engagement photos so this was a perfect redo for it! We got some great photos just the two of them which will be perfect for them to hang in their home! It was a lovely time meeting Dan as well and seeing exactly how perfect they are for each other! I hope you guys enjoy the new photos to decorate your home with! To learn more and hire Liv as your own Grand Rapids family photographer check out the website! For more blog posts like this click the links below! Julia and Robert might be one of my favorite couples! Their sweet loving energy is perfect in front of the camera and this Grand Rapids engagement photographer LOVED it! Julia reached out a while back looking for a wedding photographer and when I suggested doing an engagement session as well they were excited! It always helps couples get to know me and become more comfortable in front of the camera before their wedding day! Julia is a barista at Madcap and Robert works at Spoke Folks, a bike shop! They both have a passion for bike polo, seriously look it up, so cool! It’s been fun watching them on social media enjoy that passion together! We ventured out to Riverside park in Grand Rapids, Michigan which is one of my absolute favorite places. It spans a few miles along the Grand River and offers lots of great scenery for engagement photos. They both love being outside and it was the perfect setting. From the first photos I snapped I could tell this would turn into an amazing session. Julia and Robert felt a little uneasy but when I told them that awkward means you’re doing it right and gave them some prompts they opened right up. As a Grand Rapids engagement photographer I love when couples aren’t afraid of being silly and going along with my fun ideas! Between the pond, weeping willows, dock, and trees, we got so many great images. I seriously cannot wait until their wedding next year, if it’s anything like their engagement session it will not disappoint! Keep an eye out for those images! There will be lots of woodsy elements and tons of greenery which is going to be amazing. Plus they have both had lots of practice in front of the camera now! 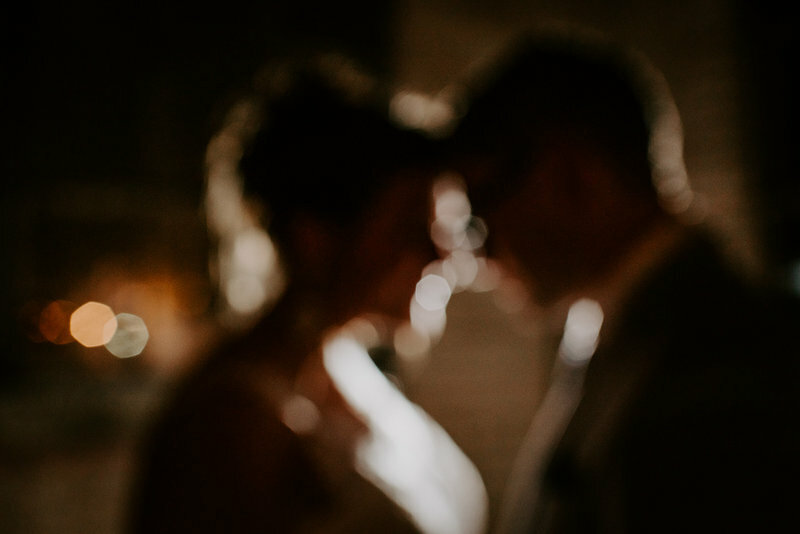 To see more from Liv Lyszyk Photography or to hire her as your Grand Rapids engagement photographer head over to the website! Feel free to read through the blog posts linked below for more! 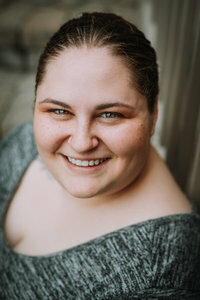 Deana reached out to me looking for a Grand Rapids portrait photographer to capture her brands! She needed some updated headshots and detail shots for her new websites! I was really excited to get the chance to work with her. As a small business owner myself it’s always so fulfilling helping other women push their business to the next level. Solid headshots can make a big impact, especially for social media and websites. We decided to work around her home in Grand Rapids. She works from home and has a really nice home office set up that was perfect for some of the images. I loved how secluded their home is and it felt like a totally different place. I can see why they love that location so much! We chatted over coffee and got to know each other a bit, realizing we really did have a lot in common! It always helps to have that connection before photographing and helps me pick out important elements to include. As a Grand Rapids portrait photographer I get to meet a lot of really amazing people and Deana is no different. Her energy is great and she warmed up super quickly! We went down to the water for some photographs, and luckily didn’t fall in! I have a huge fear of stumbling with my cameras around water haha. Thankfully both my equipment and I stayed dry! This was such a fun session, a great break in the busy wedding season. Even though I consider myself a Grand Rapids portrait photographer it can be hard to find time between weddings, so this was a treat! I can’t wait to watch Deana grow her businesses too and hope that these images are a part of that! Check out Liv Lyszyk Photography for your Grand Rapids Portrait Photographer needs! Feel free to read through the blog posts linked below to see more! I knew Genna and Nolan in high school. If you would have asked me who was “most likely to get married” it would be them. If you would have asked me who was “most likely to become a Grand Rapids engagement photographer” I would have hoped it’d be me! Well I guess we both won because these two are finally tying the knot and I get to capture it! We picked an absolute perfect day for doing photos, and it was so fun catching up. Genna and Nolan weren’t too sure where they wanted to do their photos. Understandable since there are so many amazing places! I asked them if they’d be willing to come up to Grand Rapids from Kalamazoo. They were totally down and we picked Provin Trails! This park is massive and full of amazing spots for photos. Plus it’s dog friendly, a plus for their sweet pup! When we first got there we walked into the park a bit before getting some photos with them and their furry family member. Once we got some good photos with Oliver he hung out in the car for a little bit. Don’t worry, the air was on and he was jamming to his favorite music! We walked a bit more and really got to go to the best places in the park. I was so happy they trusted me to be creative and pick some good spots. It’s been a fun season of life for me to see people I know getting married. In fact, most of my weddings for next year are friends! It makes my job super fun and easy because I already know so much about them! I think knowing your photographer can really help you open up and be more comfortable! I’m so excited to get to work with these two in January! They will be my first wedding for next year and I’m pumped! And if you need a Grand Rapids engagement photographer hit me up! Booking season is right around the corner!